Members of the UNCG Faculty Champions for Internationalization group, including Dr. Nir Kshetri, right, professor of Business Administration, met with the ACE External Review Team. Other faculty pictured are (from left) Joseph Erba, Entrepreneurship, Tuisha Fernandez, Associate Director of the Bryan MBA Program, and Dr. Jane (Ye) He, ESL Program Coordinator in the School of Education. 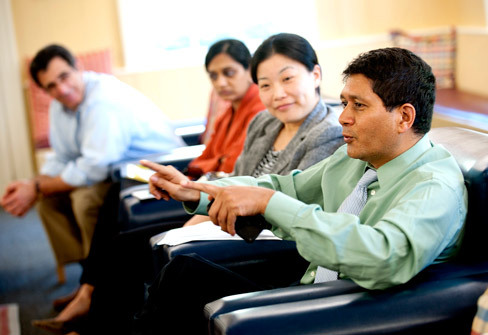 UNCG's Internationalization Taskforce joined the American Council on Education (ACE) Internationalization Collaborative, a group of more than 100 institutions that helps faculty and administrators share ideas and strategies for furthering international agendas. UNCG was among only eight institutions selected to participate in the ACE Internationalization Laboratory. In December, the taskforce completed its report, making recommendations that will aid faculty who have an international focus, add student international competencies into coursework and raise the visibility of international activities. In March, an ACE on-site external review team visited UNCG, meeting with various stakeholders of internationalization including Chancellor Linda P. Brady and Provost David H. Perrin. In the external reviewers' report, UNCG was praised as a leader in student exchange and lauded for its strong foundation of internationalization. We have to use the momentum gained through this insightful project to make sure UNCG is recognized widely for its high impact international practices and to invest in providing students the best global education available, said Brady. Taskforce co-chairs Dr. Penelope Pynes, associate provost for International Programs, and Dr. Jerry Pubantz, dean of Lloyd International Honors College, led a group of faculty and staff from across campus in the internationalization initiative. As a result of UNCG's participation in the laboratory, Chancellor Brady has been invited to share the university's internationalization strategic plan in several ACE venues.